Anyone filled the cake the day before and refrigerated it? Answer for Crystal 777, half-a-half is a cream it is sold as half-a-half in the dairy section. if you can't find it mix half whipping cream and half coffee cream. I really love the way this came out and it tastes wonderful, but I want to put it in a cake. So I made the filling and refrigerated it and now it's not creamy like it was at first. It seems like it's separating since it has butter. Any suggestions as to what to do???? 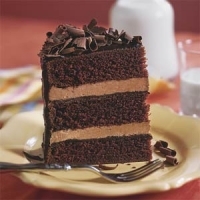 I love the way it tastes and it would be great as a filling in the cake but I need to make it ahead of time. Help! Oh MY! That cake looks delicious! Heaven.....I'll eat all this chocolate and be awake for a week!